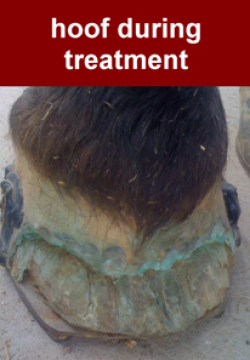 Stop the invasion of white line disease with "Thrush & White Line Treatment"
White line disease is a bacterial and fungal infection that occurs between the hoof wall and the rest of the hoof. 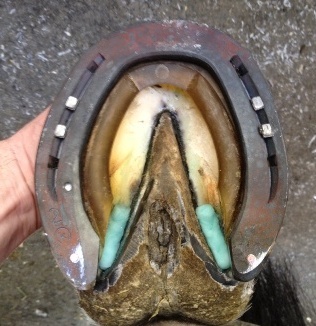 The infection causes a subsequent loss of attachment even when hooves appear healthy on the surface. The separation that this infection creates can become painful and result in structural damage to the hoof to the extent that your horse may have to be laid up during the time it takes to eradicate the infection and allow the hoof to re-grow. Your farrier may recognize it’s occurrence before significant damage has occurred. Veterinary Preference’s unique delivery system for horse thrush disease treatment is self retaining! The cotton rolls saturated in medication are applied by placing them over the diseased tissue of the foot, and pressing them into place. That means your horse will be constantly medicated with an equine thrush treatment product that is consistently attacking the organisms where they are growing! In addition, there is no mess, stickiness, or staining that is found with the other equine thrush products on the market today. How do you apply the innovative Veterinary Preference equine thrush pads to the hoof? How soon might you see results? View photos and watch a video and find out how quickly it works, even for a severe case of horse thrush. The most important things to recognize are the inciting factors that may have caused the disease. These factors have to be addressed and corrected, or the problems are likely to occur. Have your farrier address issues with long toe/low heel, excessive toe length, focal area’s of pressure, etc. You will need to address excessive moisture, poor footing, soil quality and stabling cleanliness. The farrier will remove any areas of undermined wall if necessary. This will expose the tissues to air (preventing further multiplication of anaerobic bacteria/fungus), as well as allow for drying. Treat the infected area with daily application of Veterinary Preference White Line Solution to provide a first line attack on the organisms causing this disease. This will also prevent further wall/sole separation. Your farrier will explore the tracts at each visit (2–4 weeks) and remove any debris that accumulates as well as giving you a progress report. Maintain proper shoeing schedules to prevent any further damage to the hoof wall and underlying structures.